NASA has recently chosen six proposed astrophysics mission for concept studies. Among them is the Spectro-Photometer for the History of the Universe, Epoch of Reionization, and Ices Explorer, or SPHEREx, which aims to unlock the mysteries of the universe by performing the first all-sky spectral survey. If selected for construction and launch, the survey provided by the SPHEREx spacecraft could provide crucial insights into the origin and evolution of galaxies, and could help scientists explore whether planets around other stars could harbor life. “SPHEREx will produce the first infrared spectral survey of the entire sky. This survey will have broad applications in astronomy, providing rich spectra of galaxies, quasars, stars, clusters and our Galaxy. Following the wide usage of previous all-sky surveys like the Infrared Astronomical Satellite (IRAS) and the Wide-field Infrared Survey Explorer (WISE), SPHEREx will have a lasting value for the astronomy community,” James Bock, Principal Investigator of SPHEREx at the California Institute of Technology (Caltech), told Astrowatch.net. SPHEREx will be based on a small satellite bus fitted with star trackers, S and Ka-Band antennas, and solar panels. The spacecraft will carry a scientific payload up to 69 kilograms, including a telescope for its observing purposes. It will also have photon shields, design to protect the payload from radiation from the sun and Earth. The mission managers underline that the spacecraft will have a simple and robust design that maximizes spectral throughput and efficiency. It will have no moving parts except for a sunshield and aperture cover that will be deployed only once. 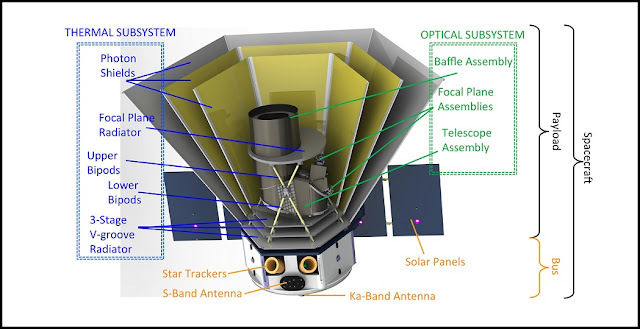 The optical payload of the SPHEREx mission will be a 20-centimeter all-aluminum telescope with a wide 3.5° x 7° field of view, imaged onto four 2k x 2k HgCdTe detector arrays. Such imaging system will allow SPHEREx to obtain spectra through multiple exposures, placing a given source at multiple positions in the field of view, where it will be measured at multiple wavelengths by repointing the spacecraft. “With multiple wavelengths, SPHEREx can assess the light production from all galaxy populations, including the first generation of galaxies formed from primordial material,” Bock said. He revealed that SPHEREx is designed to address three core science themes. Firstly, it will search for a signature of inflation called “non-Gaussianity”, a signature of multi-field models of inflation. “SPHEREx probes inflation by making a large volume survey of galaxies, specializing in lower redshifts than Euclid,” Bock noted. Secondly, the mission will survey water and biogenic ices in the interstellar medium. Given that the bulk of water in dense molecular clouds that seed star formation is in the form of ice on interstellar dust grains, scientists are particularly interested in how it gets to forming protoplanetary systems. “SPHEREx will measure the abundances of water and other biogenic ices throughout the early phases of star formation, from dense molecular clouds to young stars with protoplanetary disks,” Bock said. Finally, SPHEREx will study the history of galaxy formation by mapping large scale clustering fluctuations in two deep survey fields located at the ecliptic poles. According to Bock, the clustering signal results from galaxies tracing dark matter, and scales with the total light production. SPHEREx is expected to operate in space for 25 months. During its nominal lifetime it should map the entire sky four times. The data provided by the spacecraft could be than used by scientific community worldwide for numerous investigations and studies, yielding new results and discoveries. “We can also look forward to many discoveries by the astronomy community using the all-sky spectral survey archive that we cannot anticipate now,” Bock said. He hopes that SPHEREx could provide some important hints into the origin of the universe, improving our knowledge about its birth and evolution. For instance, there is compelling evidence that the birth of the universe is intimately associated with inflation, a violent exponential expansion. While the basic idea of inflation has passed multiple observational tests, the physics that drive inflation are mysterious, and probably rooted in exotic physics at high energy scales beyond the reach of the standard model in particle physics. “Yet nature offers ways to constrain inflationary physics. Non-Gaussianity is characteristic of a class of inflationary models with multiple fields instead of a single field. SPHEREx will improve the errors on non-Gaussianity by more than a factor of 10 to distinguish these two scenarios,” Bock concluded. The SPHEREx mission is currently in the initial phase of studies known as “Phase A”, lasting nine months. After this phase of concept studies and detailed evaluations, NASA will decide by 2019 if the mission should be developed and launched into space. The earliest launch date is currently set for 2022.